Heat My Space & Alfresco365 > News > HEAT MY SPACE Answers - Why Choose Infrared Heating? Go Electric, Go Green! HEAT MY SPACE Answers - Why Choose Infrared Heating? Go Electric, Go Green! The Huge Positives of Heat My Space? 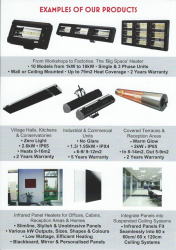 ✓ We have a huge range of infrared heaters for any situation, business, public area or home. We are not constricted or biased to one brand! ✓ Very Competitive Prices - Never never accept a quote for infrared heating without first getting in contact with Heat My Space! The Advantages of Heat My Space Infrared Heaters? Do not hesitate to get in contact with us with any questions or queries! We are a friendly family run business. 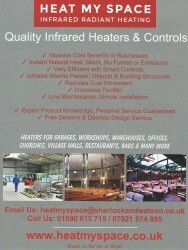 Visit www.heatmyspace.co.uk, Email heatmyspace@sherlockandwatson.co.uk, call 01590 615 715 or simply message us on our online chat!